The meaning of Gall-Goídil is "foreigner Gaels" or "foreign Gaels" and although it can in theory mean any Gael of foreign origin, it was always used of Gaels (i.e. Gaelic-speakers) with some kind of Norse identity. This term is subject to a large range of variations depending on chronological and geographical differences in the Gaelic language, e.g. Gall Gaidel, Gall Gaidhel, Gall Gaidheal, Gall Gaedil, Gall Gaedhil, Gall Gaedhel, Gall Goidel, Gall Ghaedheil etc. The modern term in Irish is Gall-Ghaeil or Gall-Ghaedheil, while the Scottish Gaelic is Gall-Ghàidheil. The Norse–Gaels often called themselves Ostmen or Austmen, meaning East-men, a name preserved in a corrupted form in the Dublin area known as Oxmantown which comes from Austmanna-tún (homestead of the Eastmen). In contrast, they called Gaels Vestmenn (West-men) (see Vestmannaeyjar and Vestmanna). The Norse–Gaels are also sometimes called the Norse-Irish and Norse-Scots. The Norse–Gaels originated in Viking colonies of Ireland and Scotland, the descendants of intermarriage between Norse immigrants and the Gaels. As early as the 9th century, many colonists (except the Norse who settled in Cumbria) intermarried with native Gaels and adopted the Gaelic language as well as many Gaelic customs. Many left their original worship of Norse gods and converted to Christianity, and this contributed to the Gaelicisation. Gaelicised Scandinavians dominated the region of the Irish Sea until the Norman era of the 12th century. They founded long-lasting kingdoms, such as the Kingdoms of Man, Dublin, and Galloway, as well as taking control of the Norse colony at York. The Norse are first recorded in Ireland in 795 when they sacked Lambay Island. Sporadic raids then continued until 832, after which they began to build fortified settlements throughout the country. Norse raids continued throughout the 10th century, but resistance to them increased. 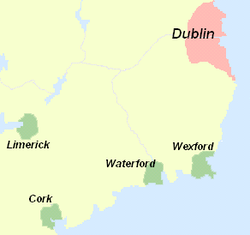 The Norse established independent kingdoms in Dublin, Waterford, Wexford, Cork and Limerick. These kingdoms did not survive the subsequent Norman invasions, but the towns continued to grow and prosper. The term Ostmen was used between the 12th and 14th centuries by the English in Ireland to refer to Norse–Gaelic people living in Ireland. Meaning literally "the men from the east" (i.e. Scandinavia), the term came from the Old Norse word austr or "east". The Ostmen were regarded as a separate group from the English and Irish and were accorded privileges and rights to which the Irish were not entitled. They lived in distinct localities; in Dublin they lived outside the city walls on the north bank of the River Liffey in Ostmentown, a name which survives to this day in corrupted form as Oxmantown. It was once thought that their settlement had been established by Norse–Gaels who had been forced out of Dublin by the English but this is now known not to be the case. Other groups of Ostmen lived in Limerick and Waterford. Many were merchants or lived a partly rural lifestyle, pursuing fishing, craft-working and cattle raising. Their roles in Ireland's economy made them valuable subjects and the English Crown granted them special legal protections. These eventually fell out of use as the Ostmen assimilated into the English settler community throughout the 13th and 14th centuries. The Lords of the Isles, whose sway lasted until the 16th century, as well as many other Gaelic rulers of Scotland and Ireland, traced their descent from Norse–Gaels settlements in northwest Scotland, concentrated mostly in the Hebrides. The Hebrides are to this day known in Scottish Gaelic as Innse Gall, "the islands of foreigners"; the irony of this being that they are one of the last strongholds of Gaelic in Scotland. It is recorded in the Landnámabók that there were papar or culdees (Gaelic monks) in Iceland before the Norse. This appears to tie in with comments of Dicuil and is given further weight by recent archaeological discoveries. The settlement of Iceland and the Faroe Islands by the Norse would have included many Norse–Gael settlers, as well as slaves and servants. They were called Vestmen (Western men), and the name is retained in Vestmanna in the Faroes and the Vestmannaeyjar off the Icelandic mainland. A number of Icelandic personal names are of Gaelic origin, including Njál, Brján, Kjartan and Kormakr (from Niall, Brian, Muircheartach and Cormac). Patreksfjörður, an Icelandic village, was named after Saint Patrick. A number of placenames named after the papar exist on Iceland and the Faroes. 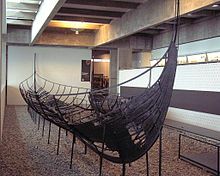 According to some circumstantial evidence, Grímur Kamban, seen as the founder of the Norse Faroes, may have been a Norse Gael. According to the Faereyinga Saga... the first settler in the Faroe Islands was a man named Grímur Kamban – Hann bygdi fyrstr Færeyar, it may have been the land taking of Grímur and his followers that caused the anchorites to leave... the nickname Kamban is probably Gaelic and one interpretation is that the word refers to some physical handicap (the first part of the name originating in the Old Gaelic camb crooked, as in Campbell Caimbeul Crooked-Mouth and Cameron Camshron Crooked Nose), another that it may point to his prowess as a sportsman (presumably of camóige / camaige hurley – where the initial syllable also comes from camb). Probably he came as a young man to the Faroe Islands by way of Viking Ireland, and local tradition has it that he settled at Funningur in Eysturoy. Even today, many surnames particularly connected with Gaeldom are of Old Norse origin, especially in the Hebrides and Isle of Man. Several Old Norse words also influenced modern Scots English and Scottish Gaelic, such as bairn (child) from the Norse barn (a word still used in Denmark, Norway, Sweden). ^ Clare Downham. Hiberno-Norwegians and Anglo-Danes:anachronistic ethnicities and Viking-Age England. University of Aberdeen. ^ Valante, Mary (2008). Snyder, Christopher A. (ed.). Early People of Britain and Ireland: An Encyclopedia, Volume II. Greenwood Publishing Group. pp. 430–31. ISBN 978-1-84645-029-7. ^ Bannerman, J., The Lordship of the Isles, in Scottish Society in the Fifteenth Century, ed. J. M. Brown, 1977. ^ Schei, Liv Kjørsvik & Moberg, Gunnie (2003) The Faroe Islands. Birlinn. Downham, Clare (2009). "Hiberno-Norwegians and Anglo-Danes". Mediaeval Scandinavia 19. University of Aberdeen. ISSN 0076-5864. Haywood, John (1995). The Penguin Historical Atlas of the Vikings. London: Penguin. ISBN 0-14-051328-0. McDonald, R. Andrew (1997). 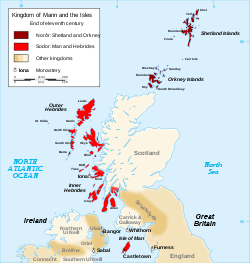 The Kingdom of the Isles: Scotland's Western Seaboard, c. 1100 – c. 1336. East Linton: Tuckwell Press. ISBN 1-898410-85-2. Ó Cróinín, Dáibhí (1995). Early Medieval Ireland, 400–1200. London: Longman. ISBN 0-582-01566-9. Scholes, Ron (2000). Yorkshire Dales. Derbyshire: Landmark. ISBN 1-901522-41-5.